Purifying, stimulating and toning. As well as the premier oil obtained from the berries of the juniper tree, there is also an oil derived from the needles and branchlets, and this is known as Juniper Needle Essential Oil, or sometimes just Juniper Essential Oil. Always bear this last point in mind if you want the berry oil! Since the natural chemistry of this type of juniper oil is not quite the same as that from the berry, the aroma is slightly different too and has pine-like overtones. 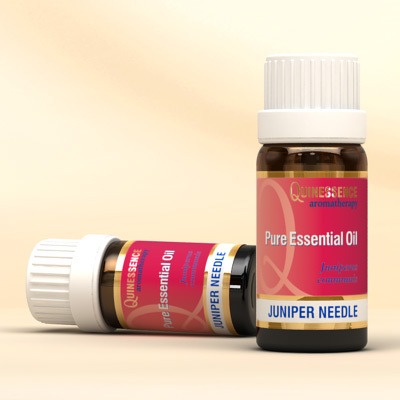 The therapeutic properties of Juniper Needle Essential Oil are similar to oil of the berry, but not quite as extensive. This type of juniper oil can be used in massage blends for easing and soothing sore muscles and joints, and on the emotional system it has a strengthening and cleansing action that helps to dispel negative emotions such as insecurity, loneliness, sadness and guilt. It’s not quite as effective as the berry oil for detoxing and cellulite reduction, but if you are on a tight budget it is less costly!